Megha Sharma did her Schooling from Vishwa Bharati Public School, Noida. She then went to KNC to do Psychology Hons. After her Graduation she did her Masters in Counselling Psychology from Amity University. She has worked before as a Psychologist and a Trainer. 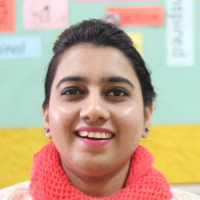 Currently she is working as a Counsellor at Kothari International School. Counselling is advice which a therapist or other expert gives to someone about a particular problem. "After completing my Schooling from Vishwa Bharati Public School, Noida, I did my Graduation in Psychology from KNC, Delhi. I then did my Masters in Counselling Psychology from Amity University. I have worked before as a Psychologist and a Trainer. I am a Counsellor at Kothari International School."